Now, where have I seen this cover before ?? Although I bought this when it was first published I can’t remember when that would have been…. its not like I kept a list…mid to late 1970s ?? 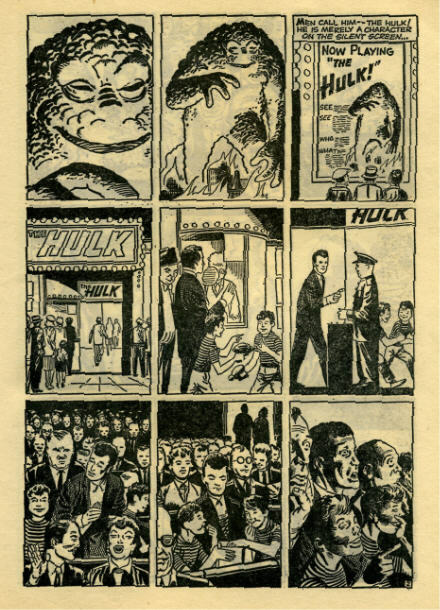 Who knows…Alan Class never dated his comics. 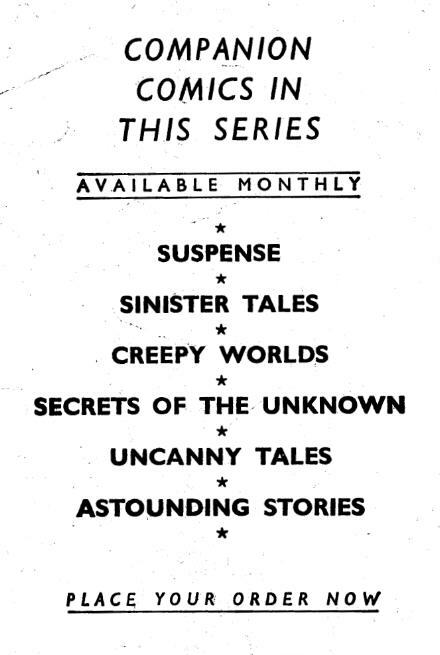 Sinister Tales, along with the other 5 main Class Series comics such as Uncanny, Astounding etc began circa 1962-1964 ?? I don’t even know if he kept to a strict monthly schedule. I don’t know much do I ?? I do know that the best interview with Alan is by Terry Hooper here. 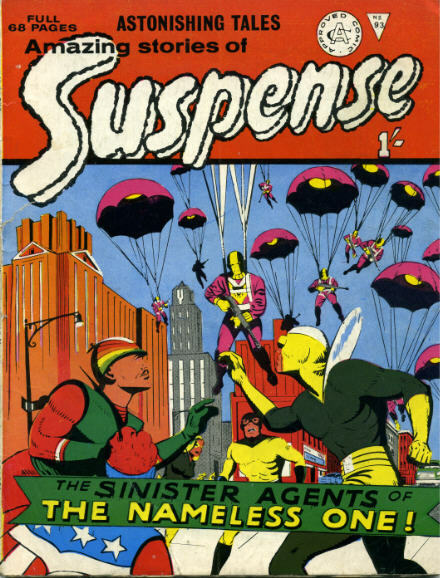 And I do know that the same cover appeared many years earlier on this comic. 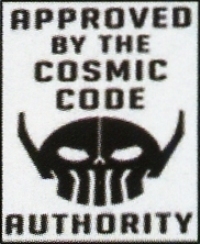 And, of course, it originally appeared on this comic. 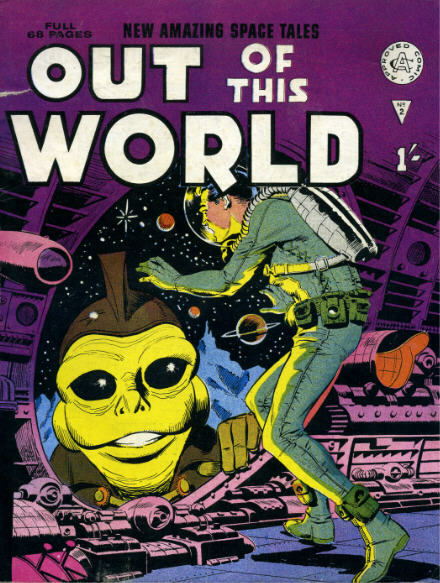 Alan Class Comics’ UK science fiction anthology comic “Out of this World” ran for 23 issues in the mid 1960s. 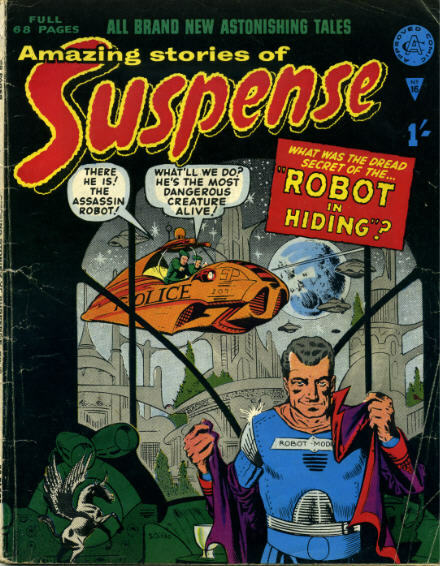 If you look the title up in the Grand Comics Database Cover Gallery they claim that issue No 1 came out in 1962. I believe it was later than that.. possibly 1964 or 1965. I bought these comics new off the spinner racks in 1966 and 1967. 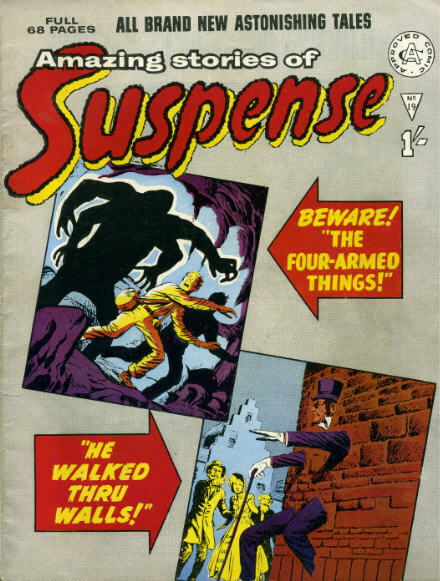 In fact I continued to buy similar Alan Class reprint comics with titles like “Suspense” and “Uncanny” until the company ceased publishing in 1989. 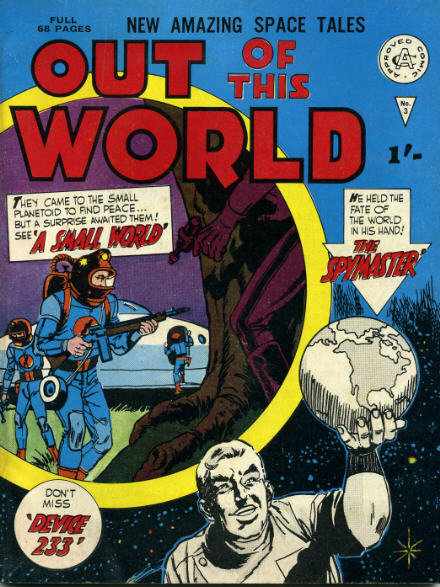 “Out of this World” consisted of 68 black and white pages for a Shilling. (That was 5p in pre-decimal money.) 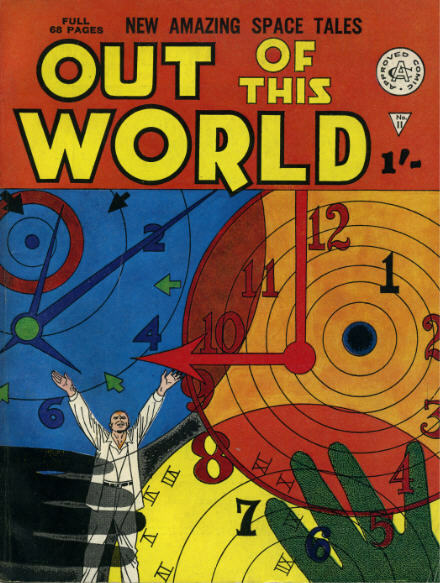 That was also the same price as a 36 page Marvel or DC comic…but the US comics did have the luxury of colour. Matters are complicated by there being no date EVER on any Alan Class book. And without the problems of a date on the cover there was always the possibility of repeat printings or even unsold warehouse stock appearing in the shops a few years after the original print runs. With Alan Class comics anything is possible. You’d think Alan would have reprinted the Charlton books in order using the Charlton covers, but no that would be too logical. 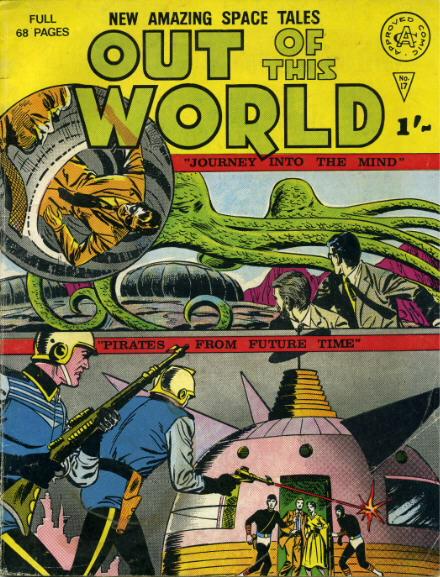 These books contained a mixture of Charlton SF stuff, Captain Atom, Marvel monsters…even early adventures of the Mighty Thor with the covers often giving no clue to what was to be found inside. 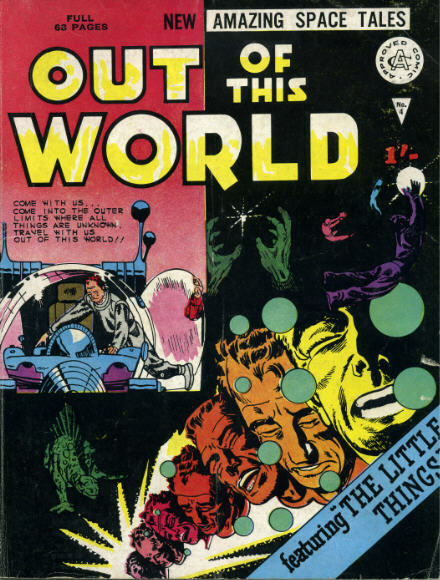 For example what is most interesting about Alan Class Comics “Out of this World” No 17 is that it contains (for possibly the first time in the UK) a reprint of Spiderman’s Origin story from “Amazing Fantasy” 15. Lets just enlarge that last panel. 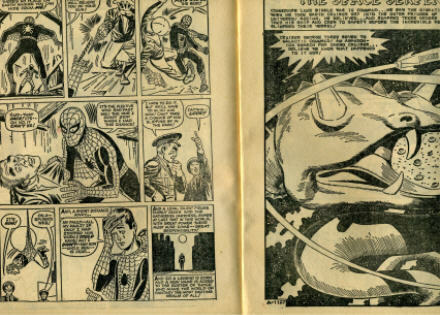 I wonder if Stan Lee and Steve Ditko realised quite what an impact Spiderman would have. Still, its a powerful line for a then obscure story in an obscure “Fantasy” Comic Book. 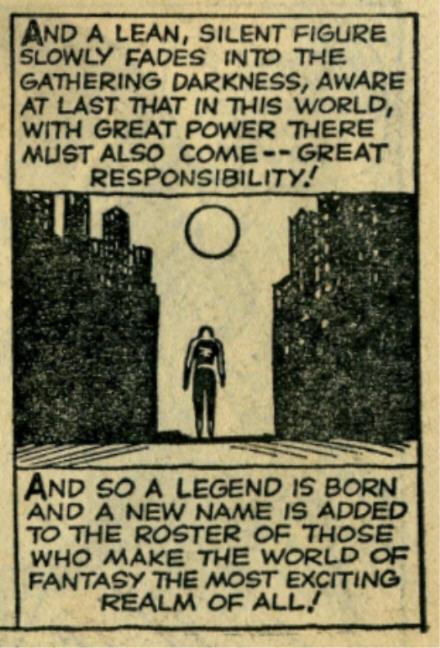 “With great power there must also come – – great responsibility!” A few Politicians should heed that! Postscript. 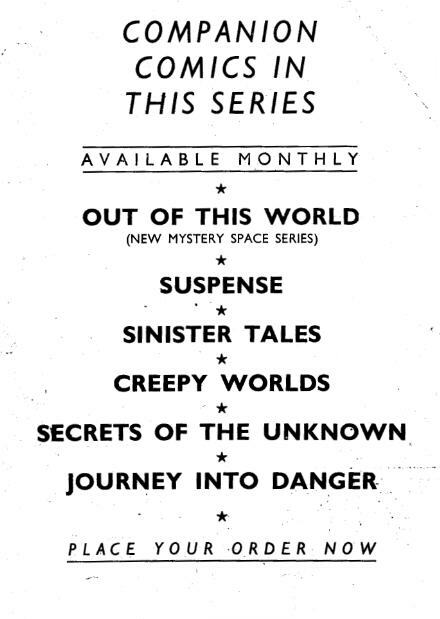 There was a second series of “Out of this World” that ran for 10 issues. The GCD have definitely got their dates mixed up here. They have No 1 being published in 1964 and yet the cover clearly shows a price of 20p. That places the comic AFTER 1971 when decimal currency began. I think 1974 is more likely the correct date for these.